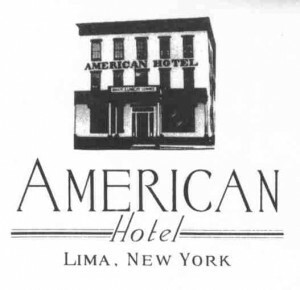 The American Hotel is a hotel and restaurant located at the 4 corners of Lima. It is in a 150-year-old building and is a member of the National Register of Historic Places. The American Hotel is noted for its homemade soups, featuring unique favorites like cheeseburger chowder, thai peanut, vegetable beef, cauliflower cheddar, and New England clam chowder. They also serve Zweigle's hots. The American Hotel has been operated by the Reynolds family since 1920. The second floor rooms are available for rent.